ABOUT 2.1 million people watched the Sinulog 2009 grand parade in the Cebu City Sports Center grandstand and along the 5.1-kilometer parade route, police said. Given the size of the crowd, they were relieved there were no reported cases of shooting, stabbing, mauling or gang violence that marred the 10-hour parade. And with so much color, pageantry and spectacular performances of 44 dancing contingents, the parade surprised and impressed first-time and regular visitors alike. “It was very beautiful, it has exceeded my wildest dreams. Sinulog has really improved so much. After the first Sinulog in 1980, we never expected that something like this would happen to the Sinulog,” said former customs collector David Odilao Jr., who first organized the annual festivity. Except for some fake tickets being sold outside the Cebu City Sports Center, a few reports on drunkenness and a reveler carrying a scalpel, no other incident spoiled the parade. Cebu City Police Office Director Patrocinio Comendador said there were no major incidents and that arrests were made only because of “proactive police actions.” They arrested one man for pickpocketing and another for selling fake tickets to the grandstand. There were 10 lost children and three incidents where they had to confiscate liquor and arrest persons for drunkenness. Comendador reported the usual crowd control problems but said they managed to control these. “For the security teams, we were in control of the situation, but let the people judge whether we failed or not,” Comendador, in his report to Roderos, said. Roderos, who roamed the city’s streets yesterday morning, stopped occasionally to congratulate his men for staying in their posts. He also talked to the dancers and asked if everything was in order. They all announced they were fine and that there was no trouble. Crowd control Despite apprehensions about the participation of Alpha Kappa Rho (Akrho) in the grand parade, no incidents were recorded. The fraternity’s dancers sported blue paint and competed in the free interpretation category. They had 73 participants. Earlier, the police provided them with police escorts in case they would get into trouble with rival fraternity Tau Gamma Phi. Some 1,500 members of the barangay intelligence network (BIN) were also fielded throughout the parade route. They were an addition to the 1,700 police officers and 8,000 members from Central Command and students on their ROTC and CWTS programs. A transformer exploded past 2 p.m. along Osmeña Blvd., but no one was hurt. Chief Insp. Arnel Banzon, who supervised security at the grandstand, said more people kept arriving in the afternoon. Saying the normal seating capacity of the grandstand is 30,000, he said the people numbered about 40,000. The most serious challenge for the police was crowd control along Juana Osmeña St., General Maxilom Ave. and Osmeña Blvd. 24-hour watch By 3 p.m. yesterday, around 300 police “relievers” assumed their posts to maintain police visibility, particularly near the bars and other entertainment centers where parties were expected to last late. The relievers were tasked to stay in the streets until this morning, said Comendador. “Whether we have provided a secure environment during the Sinulog should be left to the better judgment of the people,” Comendador said. The police enforced a two-day gun ban as part of security measures for the parade and religious activities. Over 30 fake Sinulog identification cards were seized yesterday by authorities manning the Cebu City Sports Center gates. Fire dancers Ki-Ju Park of the Yeosu Global Charity Association said he did not mind the long walk to get to the sports center, saying he enjoyed what he thinks is the best festival in Asia. “All the dancing from morning to evening is very, very interesting, I think it’s the best festival in Asia. I woke up very early in the morning and had to walk a long distance but I’m not tired, I’m enjoying this very much,” said Park, who is visiting Cebu for the first time to watch the Sinulog with 10 Yeosu City officials. He was especially impressed with the Polynesian-inspired grand finale dance number, which featured some 300 Hawaiian dancers clad in grass skirts, leis and headdresses. The dancers included Miss Earth 2009 Karla Paul Henry, television personality Cutie del Mar, Eleanor Hayco and Rica Alix of the Cebu City Dancesport Team and the wives of some city councilors. Fire dancers also contributed to the Polynesian Festival dance number, which ended with a fireworks display. Although he was impressed by the performances, Odilao said the organizers should have more contingents in the Sinulog-based category in order to preserve the true meaning and origins of the Sinulog. 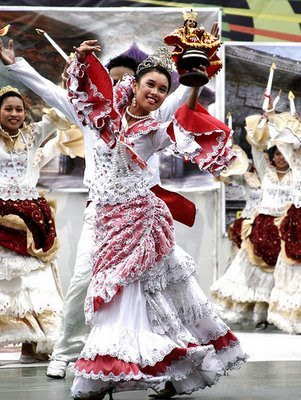 “In the first place, Sinulog is supposed to be a dance of veneration in honor of the Sto. Niño. There are so many participants now but they are in the free interpretation category. There should be more Sinulog-based contingents so we can preserve the origin of the Sinulog,” Odilao told Sun Star Cebu.